I think a lot of that’s nonsense. I think it’s someone who had this idea and got into the analytics of it and did all these running backs and went through their – whatever. Hey, Jonathan Stewart is in his 10th year and he’s hardly lost anything. Gettleman appears to believe that the case against using a top 10 pick on a running back rests on perceived longevity. He is misapprehended. Ben Baldwin, an economist (and Seahawks fan) who makes his living sitting behind his keyboard, summarized the case against using a premium pick on a running back in an excellent post at Field Gulls – do read the whole thing. I’m going to expand on two subsets of his argument: that rookie first round running back contracts are bad values, and bad risks. The objective of the first round of the NFL draft is to sign an above-average player at a below-average contract for 4 years, with an embedded team option in year 5. Article 7 of the 2011 Collective Bargaining Agreement specifies a rookie wage scale that varies based on the draft pick used to select the player. Importantly, after the 2011 CBA was implemented, the player’s position doesn’t matter: a player picked 2nd overall is paid the same money over 4 years, whether he is a quarterback, running back or long-snapper. Moreover, the market has reached an equilibrium where first round contracts are fully guaranteed. A quick survey of contracts at overthecap.com shows that position value for post-rookie contracts varies significantly in today’s NFL. As a result, the “rookie contract discount” varies dramatically by position. For example, a QB drafted with the 2nd overall pick in 2018 would be the 25th highest paid QB in the league (by average annual compensation) and would have the 15th highest guaranteed money. An RB selected 2nd overall would immediately become the 4th highest paid player at his position, with the highest guaranteed money – all before taking a single professional snap. 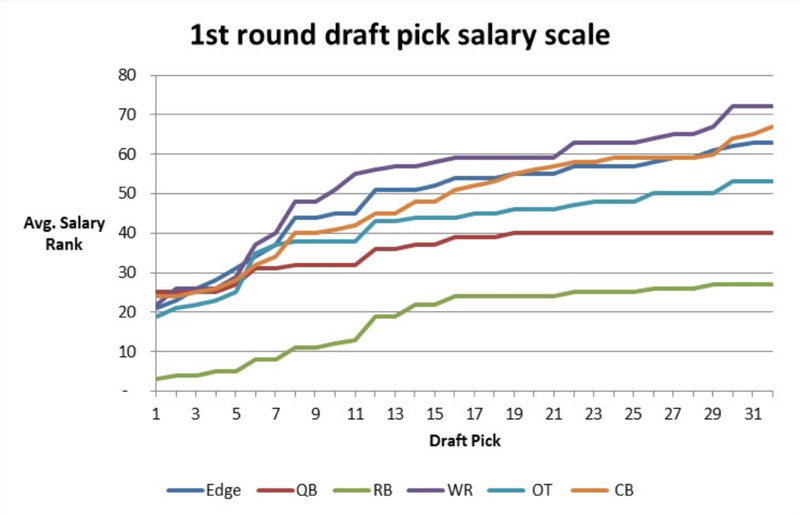 The chart above shows selected positions, with their leaguewide positional salary rank plotted against overall draft number (all data courtesy overthecap.com). Running back is the clear outlier – a top 10 pick is automatically among the highest paid RBs in the league. The New York Giants have thus expended the #2 draft pick (a considerable use of capital) for the privilege of paying Barkley the #4 annual salary and #1 guarantee at his position. They are paying (through the nose) not just once, but twice! But perhaps Gettleman is merely acting upon justified conviction. If Barkley is a generational player, surely he’s worth it? This plot evaluates the set of running backs drafted (or undrafted) between 2009 and 2014. The x-axis represents draft position. The y-axis is the player’s Wins Above Replacement (nflWAR) over the ensuing 4 years. NflWAR is a statistic developed by Yurko, Ventura and Horowitz of Carnegie Mellon University which uses multinomial logistic regression to isolate the contribution of individual players to NFL wins. NflWAR represents a novel effort to advance beyond Approximate Value (AV), and deserves wider recognition. 3. Running backs don’t really matter very much (note the Y-axis scale – over 4 years, you get at best 1.5 extra wins from a running back, and typically 0.25 extra win; quarterbacks are approximately 4x more important). The risk of a bust is even more acute with highly drafted running backs, because the financial commitment to the player is so much higher, relative to other players at the same position. A bust at QB taken at 2nd overall saddles you with the salary of a bottom quartile starter. A bust at RB at the same pick saddles you with a top 4 salary. But there is no good alternative to taking such a risk, right? Don’t you need to take risks at RB in order to win championships? Ezekiel Elliott, Leonard Fournette and Todd Gurley (taken 4th, 7th and 10th overall, respectively) are commonly cited as evidence of risks that have paid off. One recurrent theme here at MoK is the application of insights from behavioral science to football. Our past posts have relied heavily on the work of Gary Becker, Daniel Kahneman & Amos Tversky, William F. Sharpe, Kahneman and Tversky again and Joseph Henrich. Today’s post is dedicated to 1990 Nobel Laureate Harry Markowitz who demonstrated that a portfolio of individually risky assets can collectively carry less risk than any of its underlying constituents, even when adjusted for its prospective return. The above chart shows the three commonly cited high pick successes, and the RB-by-committee groups of the two Super Bowl teams. The “Draft Capital” column dispenses with the archaic Jimmy Johnson scale, instead using Dr. Michael Lopez’s blended draft curve which improves on prior efforts by not only paying attention to expected/modal outcomes, but also giving weight to the probability of drafting a superstar (i.e. the right tail of the distribution). PHI and NE expended between 1/4 and 1/7 the draft resources for their running backs as JAX, DAL and LAR. Though PHI and NE paid relatively high 2017 cap numbers, they locked up minimal resources over the long term (i.e. they could cut bait in 2018). The “gty” column shows guarantees over the entire contracts of those players (Sproles’ and Blount’s initial guarantees for PHI, Gillislee’s, Burkhead’s and White’s for NE). Using a high draft pick on a running back is a bad bet. At best, you expend draft capital in order to pay a guaranteed contract at a market equivalent price for a good player. At worst, you overpay twice: in draft capital and guaranteed salary for a bad player. Drafting a running back is risky. By assembling a portfolio of RBs, one can achieve similar performance to drafting a star, while diversifying risk, and saving draft / guarantee capital to deploy elsewhere. Your mother was right about eggs and baskets. The above argument relies upon the prior work of a number of individuals who sit behind keyboards, all of whom have advanced degrees in a quantitative field such as economics, and none of whom have played a snap of professional football. Gettleman, a #TrueFootballMan, will confidently dismiss this argument, regardless of its merit, due to its provenance. Eagles fans should pray he never gets fired, and lives forever. Tagged with 2018, NFL Draft, Running Back, Dave Gettleman, New York Giants, Statistics, First Round, Quarterback, Salary Cap. May 3, 2018 by Brian Solomon.